Test Equipment Designed to Last and Fabricated From Steel. The DuraTap sieve shaker is well-known, highly prescribed machines for running quality control checks and inspections on a variety of construction materials. Sands, gravels, stones, concrete powders and soils are classified and evaluated using ASTM test sieves running in the DuraTap sieve shaker. 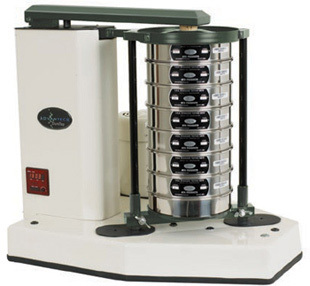 Lab test results using the DuraTap sieve shaker are generally used to accept or reject incoming construction materials, based on particle size. NOTE: Sieves, covers and pans not included. Must be ordered separately). Kits are available for customers who want to convert their existing units to accept either 8" or 12" sieves. No need to incur the expense of another shaker. Simply unscrew 4 bolts and loosen 2 hex nuts. • PA8 - converts your 12"unit to accept 8" sieves. • PA12 - converts your 8" unit to accept 12" seives. Click here to view available sieves.